Sometimes. for no reason at all, some Windows features will stop working. 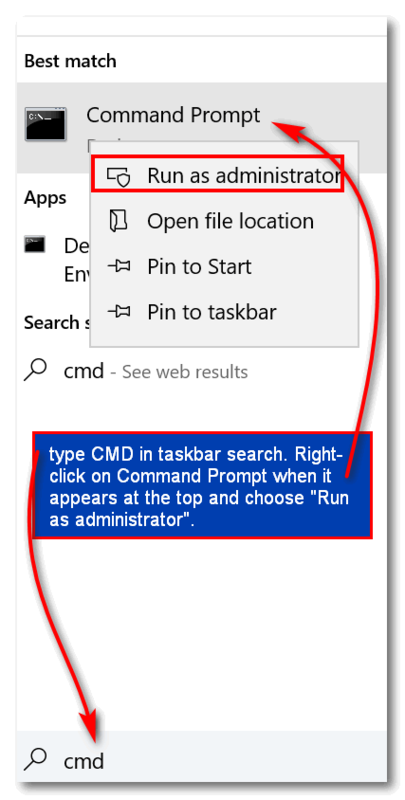 The Windows 10 start menu and/or settings may stop working. Cortana, Windows Store / Windows Store Apps or other Windows 10 features may suddenly stop working. Usually, this happens after a version update or after a cumulative Windows update, and rarely it happens for no apparent reason at all. Shut down your PC completely. Wait 4 or 5 minutes. Wait while Windows 10 loads completely. Try your computer and check to see if you still have problems. If that does not work, here’s something you can try that has worked for us many times in getting Windows 10 computers working correctly again and all Windows 10 features functioning as they should. 3.) Enter the following commands, one by one, and press Enter after each. Each command will take some time to run, so be patient. When all commands have completed, restart your computer. If all went well, you should your Windows 10 problems should be resolved. If, after you’ve tried the above, you still have major Windows problems, you have the option to run a Windows 10 Reset or a Windows 10 repair installation.